Chief Inspector Thomas Nightingale, the last government-sanctioned wizard in Britain and the guy who handles all the weird stuff the Met is clueless about, and his apprentice Peter Grant are on a new case. The body of a jazz musician is found with strong evidence that he was killed by magic. Grant, whose father is an influential 'almost made it' jazz musician in his own right, finds himself drawn back into his father's troubled life as he hunts down the murderer in Soho. 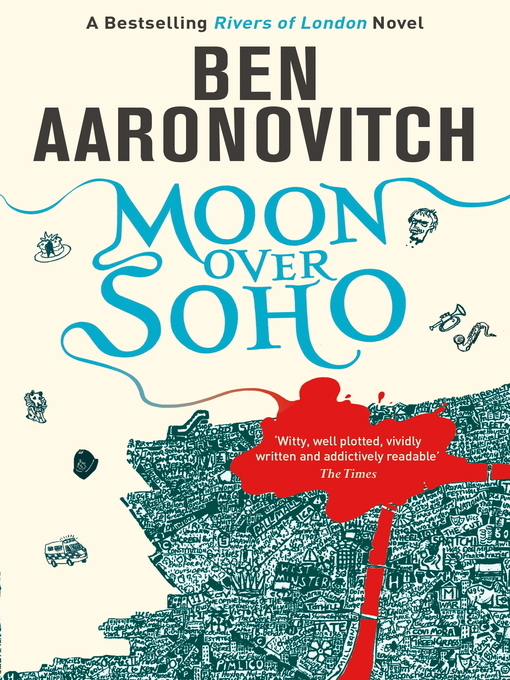 Moon Over Soho is the sequel to the recently-published Rivers of London (called Midnight Riot in the USA for reasons that have never been adequately explained), which made an impressive splash when it was released just three months ago. This series has been described as a British take on The Dresden Files and though there are vague similarities, the main difference between them is cultural: Aaronovitch lives and breathes London, its history and culture, and that comes out in his writing (not just here; anyone who's seen his Doctor Who TV serial Remembrance of the Daleks can see it there as well). London in his books, even this alterno-magical London of river spirits, chimeras and emotional vampires, is as much a character as Grant, Nightingale and the slowly-expanding recurring cast of semi-regulars. As with the first novel, this is good stuff. The plot unfolds at a cracking pace, there are intriguing backstory revelations about Nightingale and the history of magic, and the characterisation is very strong. There's some effective moments of true horror, and Aaronovitch doesn't brush the consequences of events in the first book under the table. There's some simmering subplots (like Grant's awkward relationship with the river spirits, most notably Lady Tyburn who is in danger of becoming his nemesis) and the introduction of a presumably recurring villain, no doubt sowing the seeds of a multi-book ongoing storyline. In fact, this series is screaming out for a TV adaptation, so applicable is the structure of a stand-alone main plot with ongoing subplots combined with interesting characters. There are some minor negatives: one plot twist - where Grant's judgement takes a jump out the window as he gets involved with a potential suspect - I assumed was the result of Grant being bewitched or put under a spell, but it appears not, so is just inexplicable. One bunch of characters - who have the potential to be a sort of jazz-playing equivalent of the Lone Gunmen from The X-Files - are introduced who appear to be important to the plot, but then don't do much here (I assume they'll be back later on). Nightingale has some key scenes but generally sits a lot of the book out. In this sense the TV correlation is less successful as there's a fair amount of loose ends left flapping around where their establishment doesn't accomplish much in this book (whilst others, like the setting up an ongoing villain, work much better). Still, we don't have too long to wait for the third book: Whispers Under Ground will be out in November this year. Moon Over Soho ( ****-and-a-half ) has a more focused plot than the first novel but also feels a little more unresolved, so it evens out. It's still a relentlessly entertaining, fast-moving and enjoyable urban fantasy with intriguing hints of greater depth waiting to be explored. The novel is available now in the UK and USA.